After my first Drone Racing League experience at BMW Welt in Munich I got asked to join DRL again during the season finale in Saudi Arabia. A week to never be forgotten, thats for sure! It was quit the journey, flying from Amsterdam to Dubai, from Dubai to Jeddah in Saudi Arabia and a transfer of roughly one hour to a new city called "King Abdullah Economic City", also called KAEC. Imagine a city that is closed off, not accessible to the public, only for people who got invited or that work in there. A pretty strange concept if you ask me. Most of the time the place felt deserted, which also explained why everything looked so new and untouched: the crowds visiting this place were minimal. Due to the fact that it was a closed off city we were allowed to roam the streets freely, but were not allowed to leave the city without a guide or what so ever. I settled in my way to luxurious hotel room (thanks Saudi!) and after catching up on some sleep I decided to walk to the event site. Then it hit me, literally, the temperature was around 40°C with a humidity of 80%. A short walk of 10 minutes got me soaked through and through. Even during the event that was held at night times I could have swapped t-shirts every 10 minutes, but I just learned to except that my cloths were gonna be soaked all the time. To give another example: my camera needed to be outside 30 min. before I started shooting, other wise it would be all fogged up, even the sensor AND inside an air-sealed lens, everything would fog up. Insane working conditions? Yes, pretty much! But hey, it was the DRL season finale, I would have worked in any weather conditions for that. Season finale time! We had 2 days of shooting, the first day was practice day combined with a short live broadcast for Saudi national television. The last day was planned for finals. The track was in-sane. They took a small part of the city and turned it into a race course. Something you really have never seen before. Just like in Munich, there was a live crowd during the finals and I was really surprised how much the 3000 visitors were involved in the race. With every heat the crowd counted down on full volume and went completely nuts as soon as the drones took off from the start grid. Never seen anything like that during a European race, not even at the Shanghai drone race where the crowd was enthusiastic as well. To be honest, I have never witnessed so much tention during the races. 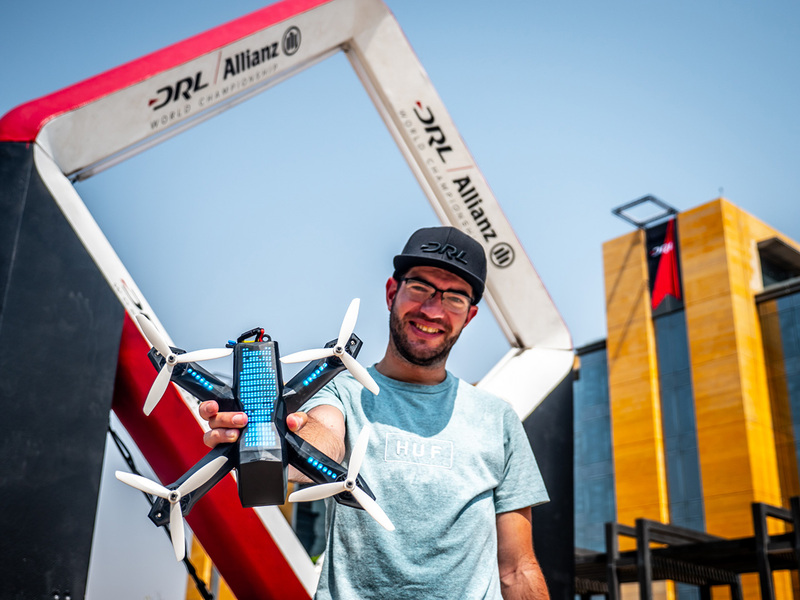 All the pilots were so dead set to win this season finale and call them self the "DRL World Champion". Of course I was rooting for my fellow Dutchie Ralph Hogenbirk / "ShaggyFPV", but I had to say, if there was one pilot flying super consistent the entire event, it was Paul Nurkkala aka "Nurk". So when I was asked at the beginning of the finals days who I thought would win, my answer was "I hope Shaggy, but I think it's gonna be Nurk". And I turned out to be right. After tons of super intens heats, the big finale was there. I was holding my breath for almost the entire race because it was so tense. Afterwards there was a small ceremony for Saudi press, but then came the real bummer. Due to many delays during the event (think of technical issues, or broadcast hold ups), I had to go to catch the plane that was booked for me, before the real ceremony began. I stalled my transport to the airport as much as I could, but to bad, I just had to go. Bummer for me as also for DRL because they missed a ceremony photo (since I was the only photographer for DRL on site). All in all it was a week to never forget. To travel all the way to Saudi for this event, the side events, hanging out with the pilots and crew, tons of laughs. I will never forget these 2 mind blowing DRL events and want to thank them again for having trust in me and giving me such an opportunity.